Water is great — in your bathtub, pool or sink. Not on your floors and seeping into your walls. Water can also be expensive … when it’s damaging floors, ceilings and even a home foundation. And with water, once it gets into the building elements of the home, it can leave behind nasty remnants, like mold and mildew growth. Tip #1: Repair and replace old caulking or missing tiles anywhere in the bathroom. Moisture that gets into your walls or behind tile can turn into a mildew problem. Tip #2: Swap out an old toilet for a Protector No-Overflow toilet. 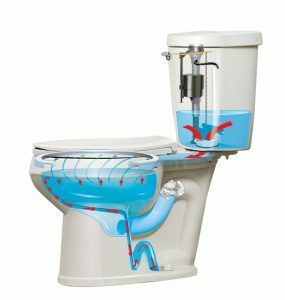 This toilet prevents water from overflowing onto the floor if the toilet is clogged by channeling it into a secondary drain system! Tip #3: Before the winter cold comes, help prevent pipes from freezing by insulating them. You should also seal air leaks around or near the pipes. When it turns frigid outdoors turn on both your cold and hot faucets near outside walls to allow a small trickle of water to run throughout the night. And, if away from home during the winter, turn off the water at your main valve. Tip #4: Watch what you put down drains. Grease, which can congeal and cling to your pipes, should never be put down a drain. Tip #5: If you get a backup of hair and gunk in a sink or tub drain, use a drain snake instead of convenient chemicals to break up the clog. Powerful cleaners can eat away at pipes over time, resulting in a much more costly problem.